Driver Gloves w/ Keystone Thumb are made of a standard grain cowhide. 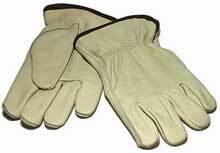 Driver gloves have a shirred elastic back for a better fit and a colored hemmed cuff. They are packaged as 1 dozen per unit and 10 dozens per case. Applications: Agricultural, Construction, Driving, Material Handling and Transportation.